On a hike she runs into a Geocaching couple and decides to pick up the hobby herself. At her first find and second Geocaching attempt, she meets Seth at his Bed and Breakfast and he takes her out. Meanwhile, her best friend, Chelsea is in her own type of rut, stuck on a man who already has a girlfriend. 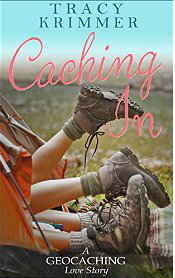 When both Ally and Chelsea compete for the same promotion at the bank, Ally’s life will turn on its head and the only constant and stable part will be her growing number of Geocaching finds. From page one of Caching In, I found the novel to be raw. It follows your average girl Ally and she isn’t all Pretty in Pink or perfect manners. She fights with her best friend. She jumps to the wrong conclusion almost every time. She’s almost thirty, but acts like a rebellious and sullen teenager. She is overly melodramatic, but also gutsy and sticks with her convictions doggedly. She is a girl to be admired, though it is difficult to see her as an adult and not as a eighteen or nineteen years old, because that’s how she acts. She gets overcome by her own emotions and drama and sometimes you just want to smack her for overreacting and jumping to the worst conclusions in both her romantic life and in her relationship with Chelsea. Over time she has to get over her romantic past and move one. “Maybe this was the problem. For so many years, I maintained the same hair, the same job, and the same things always held me back. ” (Page 168). The author falls into the trap of describing details of Ally’s environment that aren’t always important to the main narrative and I ended up skimming a lot of these extraneous parts. Krimmer also uses phrases and wording that comes off as awkward and hard to read. At times, though, Krimmer punches off a clever phrasing like the previous quote. This novel was published by Amazon December 11, 2014 and is available on Amazon here.